The Blues open a three-game road trip Wednesday at Detroit. The St. Louis Blues and Detroit Red Wings share common traits after their most recent games, but it’s not something either team will be celebrating as they prepare to meet Wednesday night in Detroit. Both the Blues and Wings scored a bunch of goals in their last game. Detroit scored five on the Columbus Blue Jackets and St. Louis potted four goals against the Winnipeg Jets. The problem was, they gave up a bunch more. The Wings were outscored 7-5 on Monday by the Blue Jackets, while the Blues were doubled 8-4 by the Jets on Saturday. Another slow start, a malady that’s been afflicting the Wings much of this season, got them again Monday as they fell behind 5-1 before staging a rally. “The first period, we got outworked,” Detroit center Frans Nielsen said. “They skated more than we did. We got outworked, basically, and I mean we don’t have the talent in here that we can afford to get outworked. 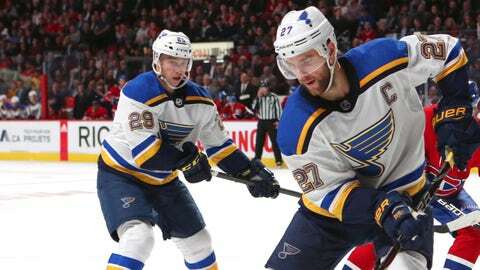 The Blues have lost four of five and six of eight and were booed off the ice by their own fans for their dismal performance Saturday. On the road, the Blues have one win in their last five games (1-3-1). They are 1-2 since Craig Berube replaced Mike Yeo as coach.